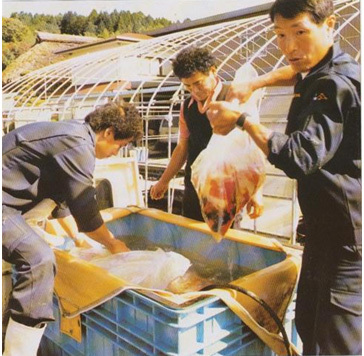 1983 – The Sakai Fish farm – Hiroshima. I first met Hideo Masutani, my English-speaking Hiroshima guide, who lives near the most beautiful seaside town of Mihara which is far milder a climate than that of Niigata. I have since spent many happy evenings strolling around Mihara which has a wide choice of seafood restaurants and bars right on the seafront. One can enjoy food and drink by gazing out to sea where many small, picturesque islands are serviced by regular ferries for the island dwellers to come and go to work on the mainland. Hideo is a ‘live wire’ and as close to a Japanese hippy that I can think of. He has his own Koi farm named ‘Masuya’ in the countryside some 40 minutes away from Mihara where I have often found good Koi for sale. After seeing his own stocks on that first visit I asked him to take me to other farms in the area, however, there are not so many outlets here and the distance between them takes up much valuable time spent in travel. He first took me to an assortment of local breeders where I tried to find even one single good Koi to purchase with no luck whatsoever. ‘I travel from England with a single purpose in mind and that is to find excellent Koi to purchase and learn more about them with every expensive trip I make. To get to Mihara I had to leave Nagaoka, where I can find many Koi and then catch an expensive bullet train to Tokyo and then another two even more expensive bullet trains to Mihara in order to find a hotel where I can stay. The very last thing I need after all my time and expense is to be taken to tiny outlets distanced miles apart only to find junk Koi waiting for me at the end of my journey’! Masutani San listened then looked at me. He then replied by saying he had no idea at all as to the quality of Koi I was looking for. He then suggested we ‘write the first day off to experience’ and then take me back to my hotel which was, by now, 80 minutes drive away. He then said he would collect me from my hotel the next morning at 6.30 sharp and he would take me some 90 minutes drive where he said to me – ‘You will find some of the very best Koi in all of Japan – I promise, and you will more than make up for one wasted day’. I went to sleep that night not really sure as to whether the promise made would really take place. The next day we set off at 6.30 and arrived at our destination some 80 minutes later after passing through some wonderful sights of the Hiroshima countryside. These sights consisted of huge rice fields, mountains, wild streams, rocky escarpments and lush green forests where Hideo said that monkeys and small black bears could be found. On arrival there was a nice, modern dwelling house and to the left, a large kennel which housed an even larger, lazy and sleepy St. Bernard who took no notice of us at all. To the front of the house were long concrete ponds, some were single units whilst others had been divided to form smaller ponds. These were all built over with a metal framework and then clad in polythene. On looking into the smaller ponds there were male and female Koi in all stages of spawning and each pond was full of artificial spawning grass. The larger ponds contained Koi in all shapes, sizes and varieties and Hideo advised me that these were for sale. A few minutes later our peace was shattered by the arrival of large trucks carrying transportation containers and staff. These trucks drove to more concrete ponds nearby that I had not yet noticed. We both made our way to watch the Koi be off-loaded whilst Hideo informed me that these Koi had just been brought from indoor ponds some miles away which also belonged to Mr. Sakai. These Koi were new ones to be offered for spring and summer sales and were removed from the containers to the ponds by the hundred, in all, a huge operation that Hideo kept telling me I had only seen ‘a small part of it’ and that many more Koi would be added to these over the next few days. I ‘stole’ this picture from my book ‘Koi Kichi’, however this is the only copy of the picture I possess and it was taken on my very first visit, described above, to the Sakai Fish farm, Hiroshima in 1983. The man in the centre is the younger brother of Hiroji Sakai, owner of the farm. We spent the entire day at this enormous farm and I was later introduced to Hiroji Sakai himself, a very jovial man, who insisted on taking us out for lunch and sampling ‘Okonomayaki’ which Hiroji described as ‘Japanese Pizza’! I bought more Koi on that visit than I could have dreamed of and Hideo’s promise turned out to be the complete truth. There were Koi in every variety possible, amazing Shiro Utsuri, Ai-Goromo, hundreds of Go-Sanke, Shusui, Kawarigoi – the list went on. That first day at SFF produced more Koi than I could have found in three days in Yamakoshi. I then looked at the pile of Polaroid pictures I had for my purchases and then began to consider the paperwork I would have to do that night at my hotel before bed. Just as we were about to depart for Mihara, yet another truck pulled up and we could not leave until we witnessed the off-loading. I will never forget Mr. Sakai’s look on his face when he saw me returning and I bought two of the most superb sansai Tancho Showa which I have never surpassed since, and, at a price so low, he may just as well have given them to me! My first impressions were of ‘a whole new avenue to high class Nishikigoi’. Sadly, Hiroji died in late 2008.